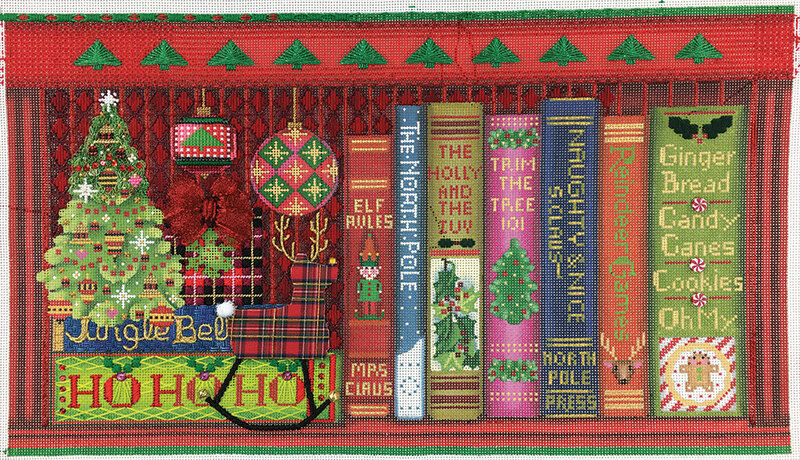 I love the big fluffy bow on Santa’s Books by Melissa Shirley. I made it from WireLace which is one of my favorite things to work with. WireLace comes in several sizes. I primarily use 6mm and 12mm. 6mm comes in more colors so YAY! 6mm is easier to pull through the canvas so YAY! Again. For this bow I would have used 12mm but it isn’t available in red, so now you know how and why I chose 6mm for the bow. Here’s how I made this bow. It is a seris of large loops of Wirelace! Cut eight 7 inch lengths of Wirelace. Each length will make one loop. Granted the bow on the canvas is painted with 4 loops but our WireLace isn’t wide enough. Tie a knot at one end of a piece of Wirelace, thread the opposite end in your needle. Bring the needle up toward the center of the bow. Gently spread the wirelace to make it wider. This is the magic of WireLace. You can pull it side to side and it will expand. You can expand it a lot. Remember the wider you pull it the shorter it becomes. Loop the Wirelace folding it back on itself to make a loop. Sink the Wirelace to the reverse. Using a single strand of invisible thread, tack the loops as necessary. 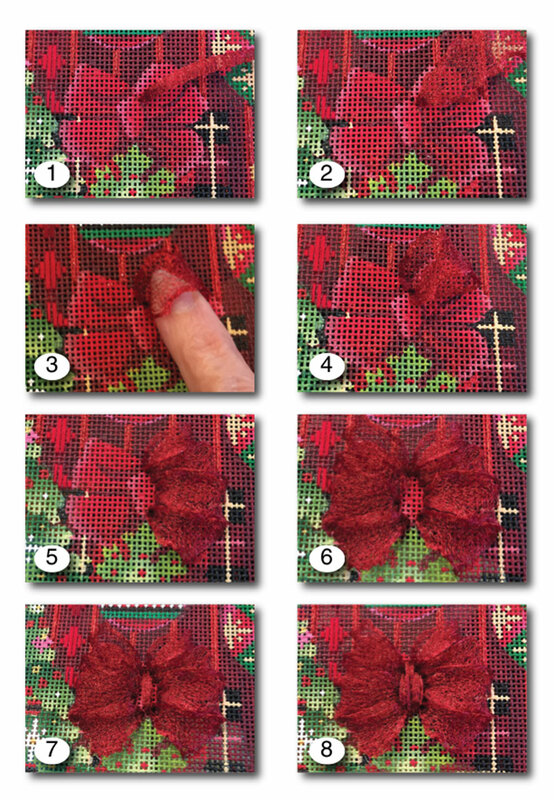 One stitch on each edge at the back of the bow near the fold and possibly one at the center of the fold should do it. Secure the Wirelace on the reverse. Repeat making additional loops to cover the painted bow. 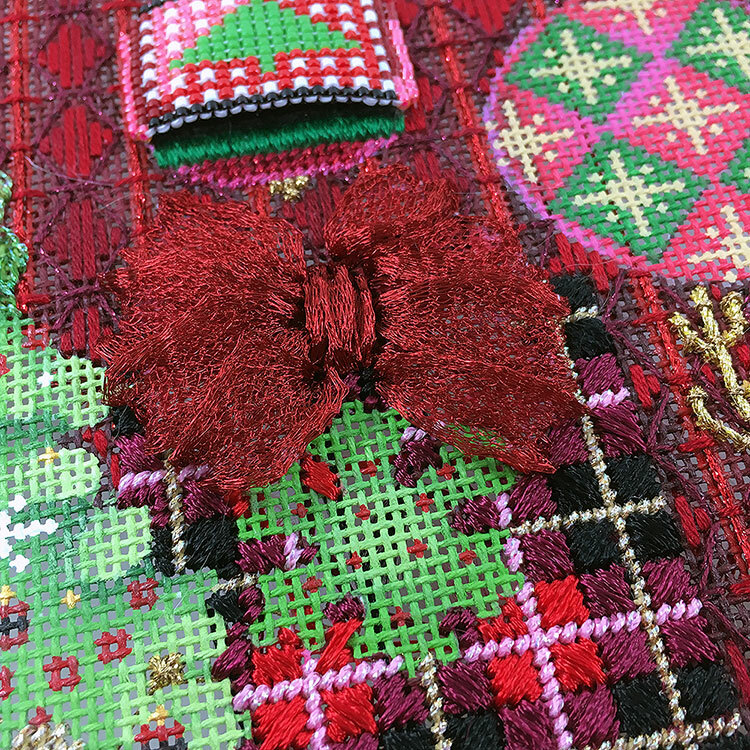 With the remaining Wirelace, work several long stitches up through the center of the bow to form the knot. And now you have a big fluffy bow. Easy Peasy and just slightly fiddly. Here is is on Santa’s Books looking all bright and fluffy. If you would like to order Santa’s Books, here’s the link. This is fabulous. I always read your emails and love your stitch suggestions. Is it possible to order this wired lace from you? What colors are available in 6 and 12 mm and what is the price. I will call you with order when I know more. Where do you get wirelace? We sell it. 🙂 We stock most colors of 6mm. Others can be special ordered.